High Resolution: Yes; Compatible Browsers: IE10, IE11, Firefox, Safari, Opera, Chrome, Edge; Compatible With: Bootstrap 3.x; ThemeForest Files Included: PHP Files, HTML Files, CSS Files, JS Files; Columns: 4+; Documentation: Well Documented; Layout: Responsive. 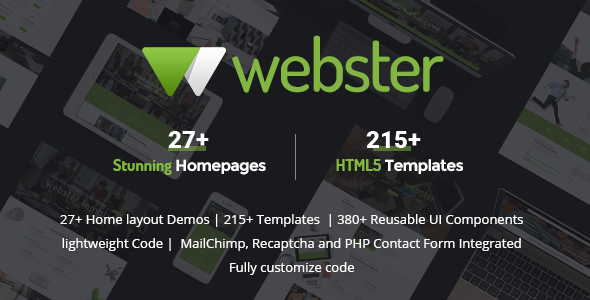 Webster is an exclusive multi-purpose 100% responsive template with powerful features. Simple and well-structured coding, high quality and flexible layout, scalable features along with color schemes to create tailor-cut websites. With bootstrap, responsive mega menu and various layouts including incredible blog themes, Webster offers you unfathomable accessibility to build beautiful and customer-oriented websites. Unique designs, eye-catchy portfolio and innovative website building tools work seamlessly to boost your business online. This template is designed for all types of businesses such as Corporate, Business, Portfolio, Creative, Blog, Agency and many moreЎ­ Customize according to your business or client requirements with the ultimate features. Lightweight template ЁC Yes, there are only few scripts loaded at the bottom of HTML file. All other plugins will load dinamicaly only when needed on the specific page. You don't need to add plugins menually. i.e: If you use Owl Carousel on home page then owl-carousel.min.js file will load dinamicaly. If no plugin is needed, then no plugin is loaded. Notes: Images and video used in the demo are not included in the Downloaded Package. However you may purchase it separately. Webster comes with a detailed documentation. If you have any further questions Contact us We'll be glad to help you! Car Dealer - The Best Car Dealer Automotive Responsive WordPress Theme; SEOhub - SEO, Marketing, Social Media, Multipurpose HTML5 Template; CUPID LOVE - Dating Website HTML5 Template; Constro - Construction Business WordPress Theme; CUPID LOVE - Dating Website PSD Template; The Zayka - Multipurpose Restaurant, Food & Cafe HTML5 Template; Constro - Construction Business HTML5 Template. Keywords: agency, bootstrap, business, cafe, construction, consulting, corporate, e-commerce, gym, medical, mobile-app, multipurpose, one-page, portfolio, shop. Premium ThemeForest Webster Responsive Multi-purpose HTML5 Template 20904293 WordPress Themes, Website Templates, Mobile Themes, Flash Templates & Scripts from creative professional designers. Full details of ThemeForest Webster Responsive Multi-purpose HTML5 Template 20904293 for digital design and education. ThemeForest Webster Responsive Multi-purpose HTML5 Template 20904293 desigen style information or anything related.